As you know, I have set a goal to knit 12 pairs of socks before the end of 2013, and I’m right on target. My first pair of 2013 socks is finished. Ladies and gentlemen, I proudly present my Reversible Ribs Socks! Reversible Ribs Socks are done. Yeah, I know. I actually started these socks on December 23, 2012, but I had only knitted a very small amount on sock #1 before setting it aside to work on other stuff, and I didn’t pick it up again until 2013, so I decided that these socks count toward my goal. 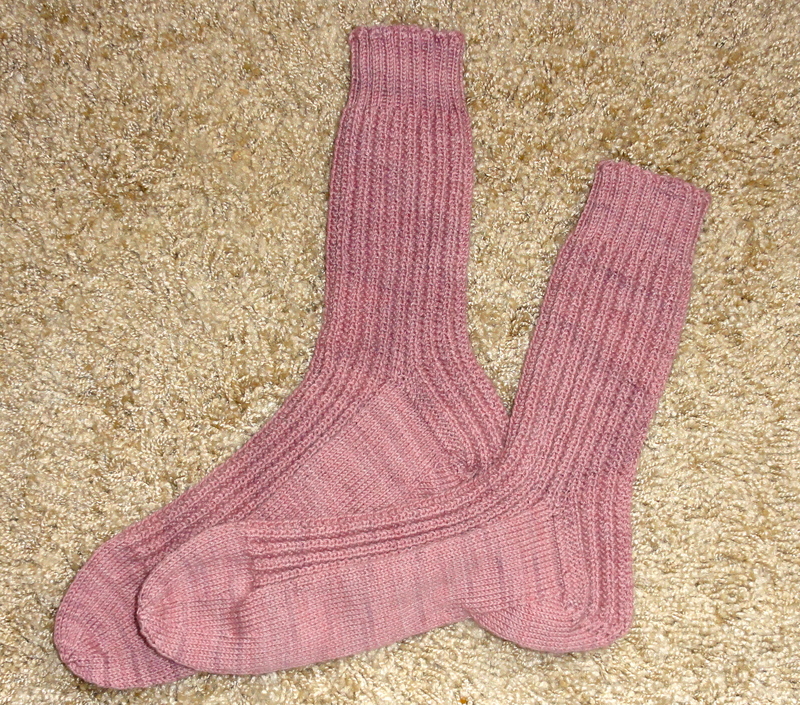 Anyway, I love this particular stitch pattern for socks knitted in solid or semi-solid colors. It has a lot of texture and it is simple but fun to knit. I decided to continue the rib pattern down the heel flap instead of using heel stitch or eye of partridge stitch, and I really like the way it flows. Another plus is that the ribbing makes the heel flap really hug the heel. I already told you about the heel gusset decreases I used for this sock here, but I wanted to share a picture of how the heel looks on the finished sock when it is being worn. Gusset decreases are on the sole instead of the instep. The combination of such a stretchy, ribby heel flap combined with the placement of the gusset decreases produced a sock heel that wraps itself snuggly around my heel, arch, and instep. 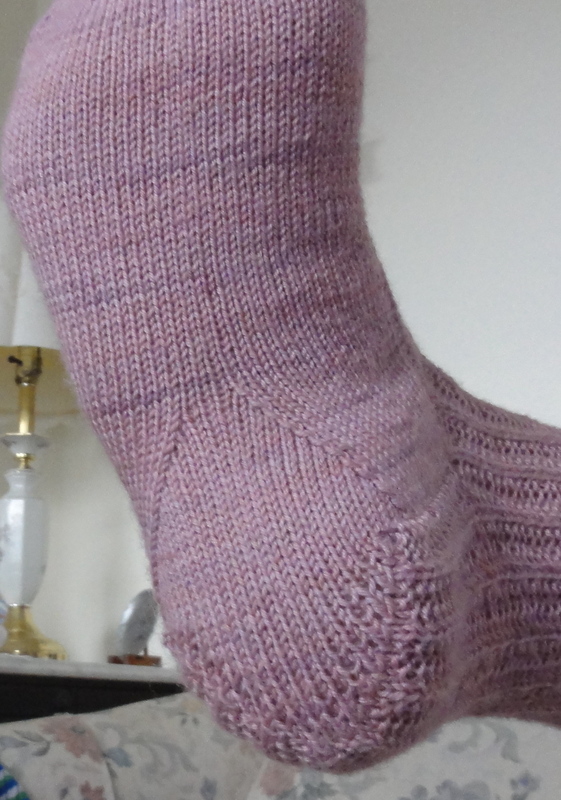 It’s the best fitting heel I’ve ever knitted, and it looks great, too. I was afraid I’d be able to feel the bumps where two stitches are knitted together, but I can’t. 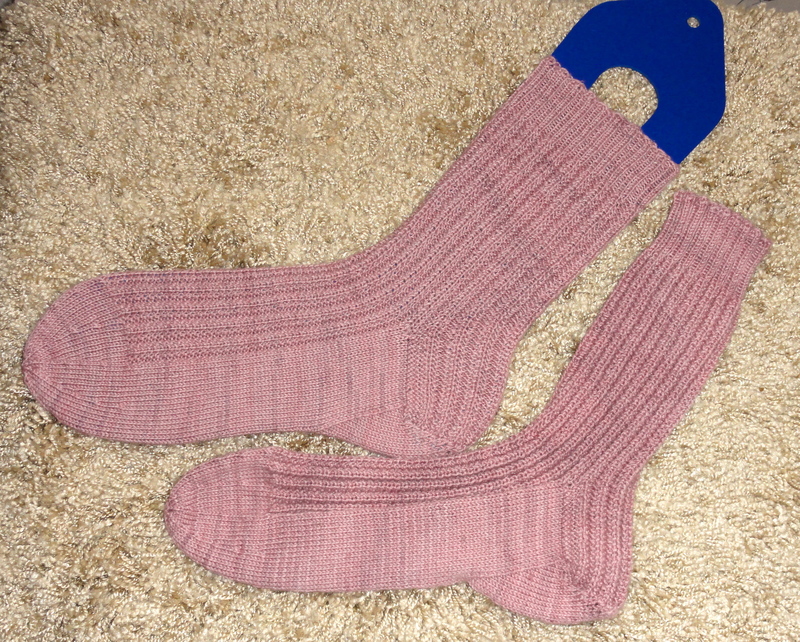 This entry was posted in Knitting, Socks and tagged hand knitted socks. Bookmark the permalink. Wow, I like the way you brought the ribbing down the heel flap. Great idea. Thanks. It’s a nice effect, isn’t it? I like that heel. I like the sock. It’s very pretty but it would be very manly too, in other colours. I’ve only done toe-up but these socks are very tempting. I might have to try something new! I agree that the pattern would be a good one for men’s socks, too. You could actually do this heel toe-up, doing gusset increases, etc., but it’s a little tricky in my opinion. There are good instruction in Chrissy Gardiner’s book Toe-Up Socks for doing a gusset and heel flap toe up called the Hybrid Heel. I made it once, and although I was satisfied with the results, it was too fiddly for my taste. Those are great. I really need to get into knitting socks again. Great socks and I really love the heel! Thanks, Tina. The heel is pretty fabulous, imo.